NEW YORK, Oct. 7, 2018 /PRNewswire/ -- NewParts is pleased to announce that it is becoming one of the first retailers to accept payments in cryptocurrency, in partnership with e-commerce platform Shopping Cart Elite. NewParts.com offers a broad selection of auto parts, covering nearly any vehicle imaginable. By now accepting the cryptocurrencies Bitcoin Diamond (BCD), Bitcoin Cash (BCH), Bitcoin (BTC), Bitcoin Gold (BTG), Dash, Ethereum (ETH), Litecoin (LTC) and Zcoin (XZC), the retailer is opening its store to customers around the world. Over the past few years, cryptocurrency has emerged as the next evolution of currency, thanks to its convenience, cost-effectiveness and decentralization. It matches the functionality of traditional fiat currency and goes beyond in efficiency, accessibility and security. In 2009, the first cryptocurrency, Bitcoin, was created and hundreds of other digital currencies have since emerged. By December 2017, the market capitalization of all cryptocurrencies reached a staggering $600 billion. "NewParts is committed to making our massive inventory of auto parts as accessible as possible to our customers," said CEO Dano Ramovich. "That's why we decided to allow our customers to pay with cryptocurrency -- it opens up our business to international markets and enables us to accept and process transactions more quickly and affordably." By paying with cryptocurrency, customers around the world now have unprecedented access to NewParts' wide array of auto parts with lightning-fast transactions that take just minutes to process. Furthermore, thanks to drastically reduced transaction fees (less than a penny), eliminated currency conversion fees and freedom from chargebacks, NewParts is able to pass on even more savings to customers. 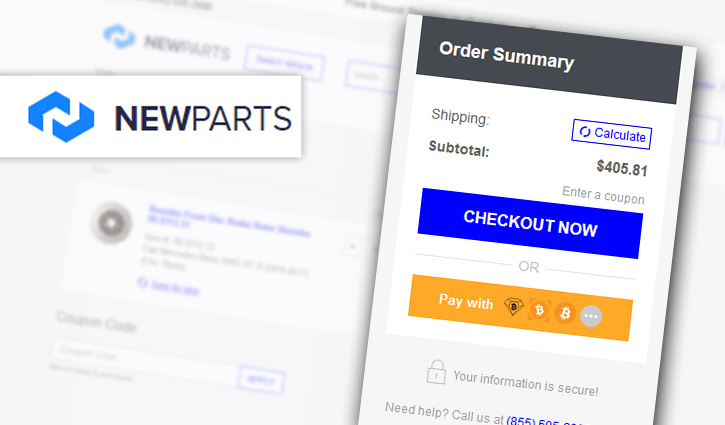 By providing customers with a wide range of payment options, NewParts is adding a new dimension to the customer experience. 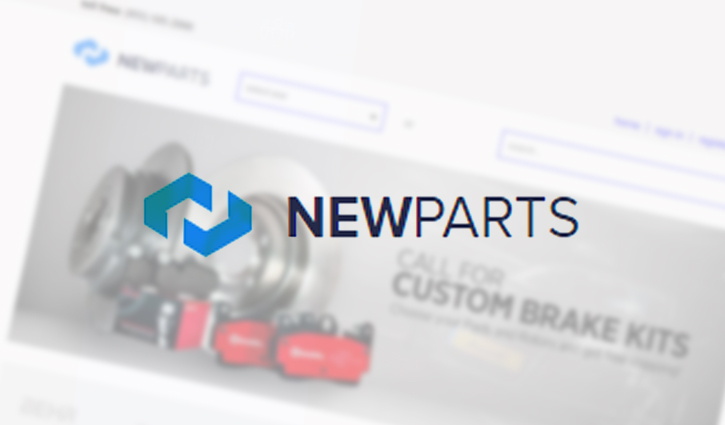 NewParts is an online auto parts retailer, offering a vast selection of automotive products at competitive prices, with a catalog of over one million parts. NewParts prioritizes the customer experience by accelerating deliveries through the strategically placed warehouses and by offering free ground shipping. NewParts' adoption of cryptocurrency payments will enable the company to expand its international reach. 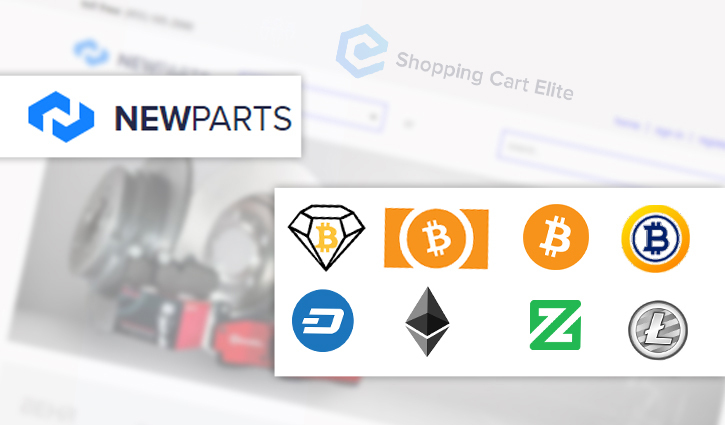 NewParts' online automotive parts store will now be accepting payments in seven different cryptocurrencies, powered by Shopping Cart Elite. Supported cryptocurrencies include Bitcoin Diamond (BCD), Bitcoin Cash (BCH), Bitcoin (BCD), Bitcoin Gold (BTG), Dash, Ethereum (ETH), Zcoin (XZC) and Litecoin (LTC). NewParts' online automotive parts store will now be accepting payments in seven different cryptocurrencies, powered by Shopping Cart Elite. 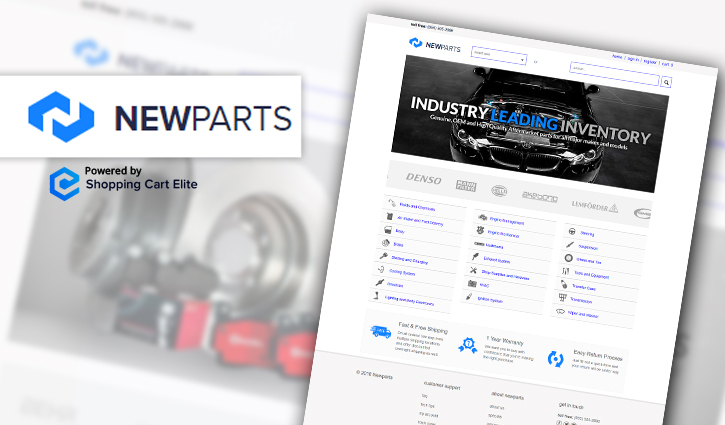 NewParts' online automotive parts store will now be accepting payments in seven different cryptocurrencies, powered by Shopping Cart Elite. This gives customers around the world access to their vast inventory of auto parts. NewParts' online automotive parts store will now be accepting payments in seven different cryptocurrencies, powered by Shopping Cart Elite. At the checkout, customers can select the option to pay with cryptocurrency.